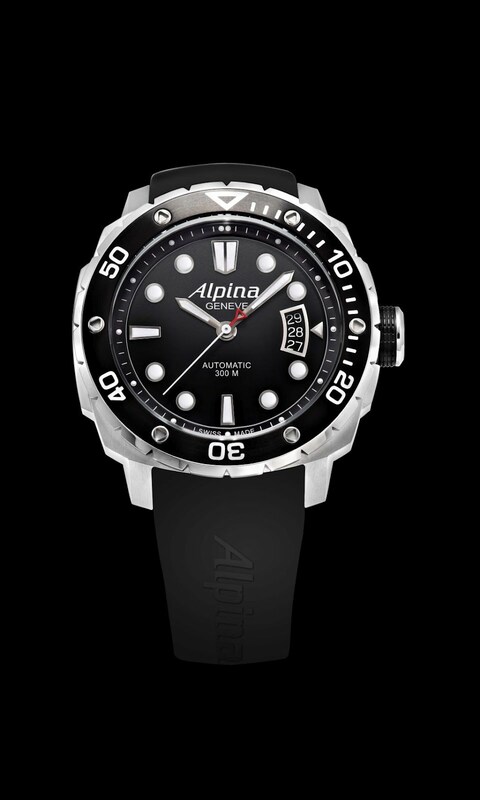 Alpina Extreme Diver is a true professional diving watch with a water resistance up to 300 meters. It’s case is made of anti-corrosive materials has a scratch proof crystals, and is outfitted with extendable wrist straps that can fit over a wet suit. The bezel of the Alpina Extreme Diver is unidirectional has luminous markers, and is used to set the maximum time a diver plans to be under water. Therefore, it is vital that the setting cannot be accidentally pushed or knocked off. Movement is automatic caliber AL-525, with functions hours + minutes + seconds and date at 3 o’clock. The Alpina Extreme Diver Collection is delivered in a special diving bottle gift box.